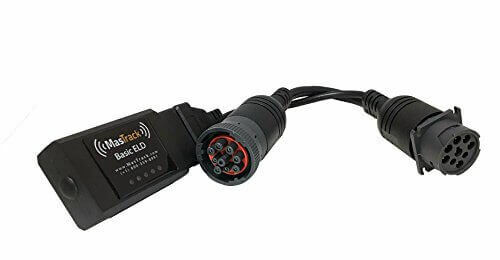 View cart “MasTrack Basic ELD eLog Starter Kit (Includes 6 months of ELD Service)” has been added to your cart. Arkon’s TAB4METKL Universal Locking Tablet Mount is compatible with tablets measuring as much as 10 1/4” x 8 5/8” x 7/8”, including Samsung Galaxy Note 8.0, Galaxy Tab 3 7.0 and 8.0, Galaxy Tab Pro 8.4, Galaxy Note 10.1, Galaxy Tab 4, Galaxy Tab Pro 10.1, Galaxy Tab S 10.5, LG G Pad 7.0, 8.0, and 10.1, Asus MeMO Pad 7 and 8, Nexus tablets, Apple iPad Air 2 and iPad Air, iPad 4, 3, and 2, and iPad mini. This sturdy locking tablet mount is ideal for the usage of with a portable electronic logging device (ELD) with a purpose to comply with the upcoming ELD E-Log mandate for commercial vehicles. It’s also great for any environment where keeping your tablet protected is very important. The 4-Hole AMPS mount base will also be screwed or drilled into any flat surface (screws not included) and includes a key lock that assists in keeping the tablet securely in place. The mount is made of aluminum and includes more than one horizontal and vertical adjustment points along both sides of the holder, making it compatible with tablets as small as the G Pad 7.0, or as large as the Nexus 10. Use a 7mm and 10mm socket wrench to adjust the tablet holder for your tablet’s size specifications.